Welcome to the Chateau de Bournand which is a family castle, located in a small village near Chinon and the Loire Valley Castles, opened all year long. The property is in a beautiful and quiet 9 acres park with outdoor pool and pool-house. Chestnuts Cottage offers 2 bedrooms up to 6. It is also possible to rent another Cottage up to 10 in the same property for larger groups. The Cottage has a large sitting-room of 50 sq-m and a full kitchen downstairs, 2 bedrooms, each with en-suite bathroom with shower and toilets. It is a perfect place for a family with young children/teenagers , or 2 couples. We provide you all what is necessary for babies, cot, highchair, baby bath, changing table, upon request. Your Cottage has its outdoor furniture and barbecue, there are a ping-pong table, badminton, petanque, and a secured pool, shared with the other Cottage. Chateau de Bournand is a perfect location to visit the famous Loire Valley Castles, as Chinon or Villandry, to go to farmers markets, visit vineyards. Bournand is a small village where you can find a restaurant, bakery, butcher, grocery, all less than 5' by foot. The towns of Angers, Tours, Poitiers, Saumur are a short driving distance. You can do lots of different activities in the area, for any age: golf courses, canoeing, horse riding or cycling. I live on the property in the main house and I am at the disposal of my guests if they need any help or information during their holiday. I also provide breakfast or dinners upon request, with home made food, fruits and vegetables from my garden, with extra charge. I spent all my holiday when I was younger in this region, so I know it quite well. I'm very happy to be back here now with my family, we all felt in love with this property and enjoy sharing it with our guests. My husband has his job nearby, and I take care of you during your stay, to give you information, good plans, or cook for you if you want! Come and see! I'm sure you will love this property as we do. It is a chateau made of the typical stone of the area, tufa stone, the park has nice old trees and many flowers all year long. Our village is quiet and well-located among castles, vineyards and beautiful landscapes. Our guests like having a drink with us before dinner, their children enjoy the pool or sometimes playing football with ours. All the bedrooms are comfortable and have a private entrance, so that everyone can have privacy. shared with the other Cottage. We use to propose a kind of schedule so that each family can enjoy the pool without being disturbed by the other guests. A great base for exploring the Loire Valley! We had a great family holiday in Bournand. There is lots to explore within a half hour drive - such as Chinon, Chenonceau, Fontevraud Abbey and, as recommended by Marie, the owner, the lovely Chateau de l'Islete, where you can picnic by candlelight during the summer. The gite itself is rustic, with pleasant garden and BBQ area and grounds, and despite some very warm temperatures during our stay, the bedrooms were still fairly comfortable at night. The local restaurant, open on Friday and Saturday nights, is also a handy place to try some of the fabulous wine from the region, without one of you having to drive and abstain! However, there are some things that I don't think are clear from the description of this accommodation: 1) The pool is a 5 minute walk away. My children are 10 and 13, and are competent swimmers, yet it is policy for all under 18's to be accompanied and supervised. This isn't a problem, as long as you don't mind walking back and forth for drinks, and being away from the WiFi! 2) There is no washing machine. Marie provides washing services for an additional charge, yet at present, HomeAwaylists amenities as including a washing machine. Having said that, we really did enjoy our stay here, I have actually already recommended the accommodation to friends (making them aware of the above). I'm happy if you enjoyed the place and the area, because there are many spots to visit all around. The most important thing for me is that our guests feel at home at chateau de Bournand, love their stay and our region. We loved receiving your family, and your kids were very nice! Concerning the pool, it is not located close to the Cottage and the B&Bs at the opposite side of the park, but when you go to the pool, your children can play in it and make noise, without disturbing anybody else. The pool is opened 24/24, you can use it even nightly if the weather is hot. We just close it for cleaning it when necessary. We are planning to add a fridge in the pool house, so that you can have fresh drinks more easily. We prefer when the children don't go alone to the pool. I'm sorry if you felt it was binding for you. As it is a private pool in a private house, children are under their parents' responsability. Safety is a very important point for us, everybody can understand that an accident can happen! The pool is secure and closed for young children. The washing machine is extra charge (it is mine) and if it was not clear before the rental, I offer it to my guests, as I did it for you. I know that it is not clearly mentioned on some listings, even if I specified it. Anyway, the most important point for me is that my guests enjoy the place, our hospitality and their stay at chateau de Bournand, and be sure that I do my best for that! 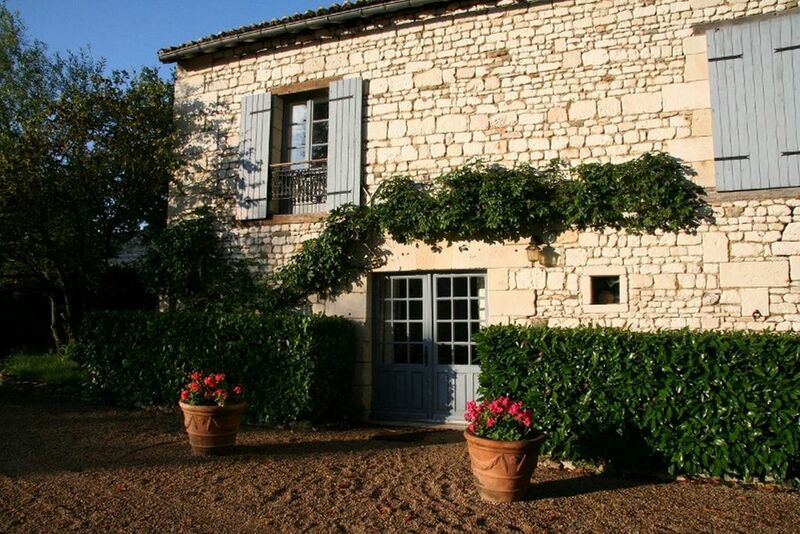 Lovely stone gite set in lovely grounds. Well equiped with everything you needed. This was a wonderful holiday, lovely property with everything you needed. Clean and tidy and very well equipped. Marie was an excellent host answered any questions and nothing was too much trouble for her. The local area was beautiful with so much to do and see. We would definitely go back and recommend this to others. Michelle and her family were very nice and respectful guests. We really enjoyed receiving them in our Cottage, and the children were also kind and quiet. Hope to see the whole family later! The area of Chateau de Bournand is well-known for famous Castles of the Loire Valley, good wines, beautiful landscapes and villages along the River Loire, churches and Fontevraud Abbey, National Horse School in Saumur and many activities all around.